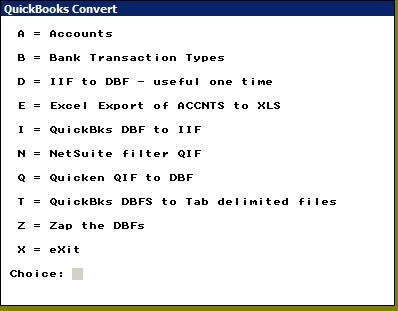 Most banks, even small ones, nowadays offer a Quicken QIF or CSV export. Then all you have to do is use NetSuite's import to get the checkbook data into NetSuite, correct? Wrong. This creates a lot of duplication of data if you have used NetSuite's check book or Bill Pay to pay bills, or if you have used the Invoice and Accept Payment features of NetSuite. These transactions will appear twice in your Check Register, the one you had in NetSuite, and the same transaction from the bank records. So how to prevent duplication? We provide you a small EXE, QIFilter or Quicken Filter, to filter out the transactions that will cause duplicates in the first place. When you import a Bank QIF file in to NetSuite, it can create unwanted duplicates of data, throwing your whole bank balance off. Here are some samples of expense that can mess up your records if they are imported from NetSuite into QuickBooks. The ones marked as "NS" would already be in NetSuite, and would cause duplicates. The number "123" stands for some account number such as "01234567890". The variable "vendor" would display some vendor's name, such as "ACME". The best thing is for the duplicates to be prevented in the first place. We do this with a customizable program that allows you to process the Quicken file before importing in to NetSuite. 1. Export to QIF format from your banks online interface.